New York is proud of its public parks, which provide necessary respite in a place where the phrase ‘the city that never sleeps’ is not so much a cliché as a truism. The latest addition has been the High Line, a raised landscaped platform running along the meatpacking district on the west side of Manhattan, occupying the site of a now abandoned railway line. Think of those 1950s movies where train tracks would rattle along two or three storeys high amongst apartment buildings – that’s the High Line, except now it’s full of trees, plants and walkers, instead of trains and commuters. It’s certainly beautiful, a place for contemplation in the most intense urban environment imaginable. It’s also brought gentrification to an area that was once run-down, and there are mixed opinions on that. In the six years that composer David Lang has been working on his opera, he has seen a rapid rate of change in the area. He wanted to reflect that in a piece, he says, without commenting on whether the gentrification is good or bad, and provide ‘a vision of where we have been and where we are going’. And so, for six days in October 2018, the High Line was not just a park, but an operatic set, the backdrop to The Mile-Long Opera: a biography of 7 o’clock. 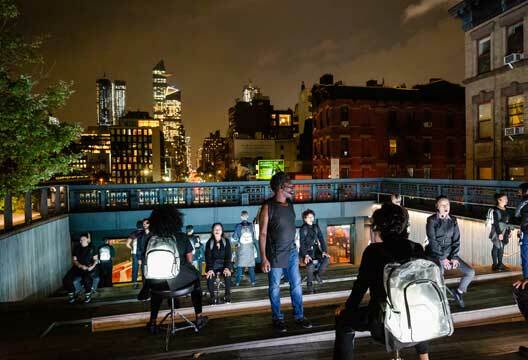 This large-scale civic musical project was created by Lang, in collaboration with the architect of the High Line, Liz Diller, and the writers Anne Carson and Claudia Rankine. It was performed by a mix of 1000 singers, both professionals and from community choirs, drawn from across the five boroughs of New York, and the tickets were free. There was no orchestra – the High Line is open air, so the sounds of the city formed the backdrop of the opera, and Lang wrote the piece to work with those sounds, rather than compete with them. The concept is visionary: in most operas you take your seat, and the characters are paraded in front of the audience at set times, with set expectations of a collective response. Lang is on a mission to introduce new audiences to classical music, showing them that its relevance isn’t restricted to wandering romantically around Vienna 200 years ago. As he explained when I met him in his New York loft, he wanted to reverse the usual way of doing things, so it’s the characters who are stationary, and it’s the audience that parades past, individuals each deciding their own pace. In this way, every experience of the opera is different, and these individual experiences sit alongside his aims for this piece: to show the lives of New Yorkers in all their diversity through narratives of life at 7pm. Whatever can happen to anyone can happen to us, whatever can happen to a city can happen to this city. The sleeping, the forgetting, the wrecking, the towering, the kissing, the scoffing, the cellophaning, the whirling snow, the sane and the inside, the red cliffs, the parades, the lipstick, the poets in fresh cloaks, the white man’s anecdotes of the black man’s anecdotes, the icing and the frosting and the defrosting and the deicing, the city cats in city hats, the famished multitudes, the rushing plentitudes, the lonely limits, the silence after ambulances, the silence after living, whatever can happen to a city can happen to this city, whatever can happen to anyone can happen to us. Onward rolls the broad bright current.